A really amazing technology has been introduced for blind people - the BLITAB tactile tablet. As far as I know, a first! The Blitab tablet uses liquid bubbles to instantly generate braille text or relief images, while the corresponding technology allows text files to be instantly converted into braille from USB sticks, web browsers or NFC tags. "Currently there are some solutions which are extremely expensive and they represent only one line [of braille]," Slavev said. "These devices were developed 40 years ago and because no one has offered any new innovations since then, that's still all that's on the market." In the UK, interest in the Blitab has been shown by the Royal National Institute for the Blind (RNIB) and Barclays bank, due to its potential for helping blind and partially-sighted customers instore. Blitab is currently in the prototyping stage but if the ongoing investment round is successful the startup is hoping to bring the first product to market by September 2016. Science fiction writers have long thought about the idea of adding tactile capabilities to devices that ordinarily do not have them. For example, Frederik Pohl's Joymaker device has a tactile net capability. The most recent version of Battlestar Galactica featured a Cylon datastream terminal with tactile qualities that was more flexible than the Tactus design. 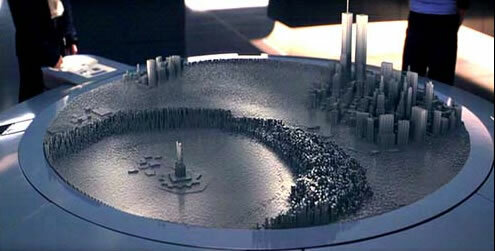 I also thought about the table display from the X-Men move, which certainly should have inspired somebody.